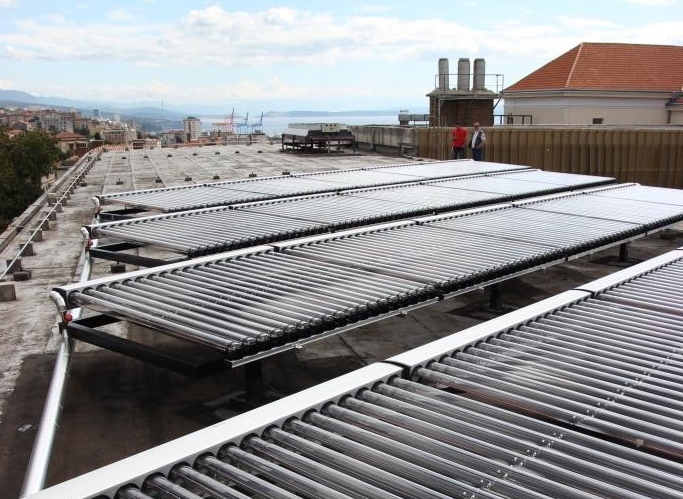 The goal behind seting up solar cooling pilot plant at the Faculty of Engineering building was to improve its energy sustainability as well as to promote and support the dissemination of solar cooling technologies for buildings’ conditioning. Apart from cooling the laboratory facilities, heating of consumption water and water in circuits within the laboratories and the possibility of cooling / heating of offices in the periods when the laboratory is not in operation, the solar cooling technology, starting from the academic year 2014/2015 is used extensively for education and research purposes. The chiller / heat pump that works with a mixture of ammonia and water. The device has the ability to achieve negative temperatures. The cooling effect is 18,6 kW at temperatures cooled water 6/12 degrees Celsius, cooling water 24/30 ° C and heating water 85 / 78oC. The chiller has the ability to drive waste heat from cogeneration, hot water from the boiler or solar vacuum collectors on the roof of an approximate area of 50 m2. All equipment, as well as plate heat exchangers, expansion vessels, pumps and control devices are made for the new laboratory system. absorption refrigeration machine, ammonia-water (PINK), solar collectors (VIESMANN-Heat Pipe), pumps (Grundfoss-frequency control), heat exchangers (plate-CIAT), piping, insulation, load-bearing structures and control devices. This demonstrative pilot plant was set up under project EMILIE, co-financed by the European Union through the “Mediterranean” Transnational Cooperation Programme.